United Nations Secretary General Ban Ki-moon and the Director General of the World Health Organization (WHO) Dr. Margaret Chan warned that the fight to contain and eradicate the largest outbreak of the Ebola Virus Disease (EVD) in history requires continuing and enhanced efforts. Figures released by the WHO on Nov. 19 indicated that the total number of cases of EVD has reached 15, 145, with 5,420 resulting in death. The overwhelming numbers of cases have occurred in three West African states: Liberia, Sierra Leone and Guinea. 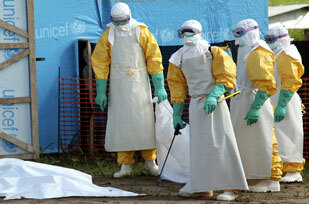 Three other African states, Senegal, Nigeria and the Democratic Republic of Congo (DRC) have been declared “Ebola Free.” In the United States there was the death of Liberian national Thomas Eric Duncan in Dallas where two nurses were infected after providing treatment to the patient at the Texas Health Presbyterian Hospital in late Sept. and early Oct. The two nurses, Nina Pham and Amber Vinson, were treated successfully in specialized units in Atlanta’s Emory University and at the Bethesda Hospital near Washington, D.C. and released. While EVD outbreaks in Sierra Leone are continuing at an alarming rate, additional cases in Mali linked to people who had traveled from neighboring Guinea was cause for concern. It has been reported that five people in Mali have died after contracting the disease where a French occupation of the north of the country is continuing in light of ongoing fighting between the Bamako-based government in the south and Islamic as well as separatist rebels. At least one other case in Mali was confirmed in the capital Bamako after the friend of a nurse who died of EVD earlier in November tested positive for the dreaded disease, health and medical officials reported on Nov. 22. The healthcare worker is said to have contracted EVD after providing treatment for a Muslim cleric who traveled from neighboring Guinea. The cleric later died after being falsely diagnosed as suffering from kidney ailments. Health officials surmise that this case allowed the disease to spread to five other people in the West African nation. Sierra Leone Doctor Dies From EVD in the U.S.
A physician from Sierra Leone, Dr. Martin Salia, died in the United States on Nov. 17 at the University of Nebraska Medical Center Bio-containment Unit after being transported here where he was a resident for treatment. Reports indicate that the delay in travel to the U.S. for treatment was a major factor in his death. Dr. Salia was the third patient treated at the Nebraska specialized facility. The two other patients were treated successfully and released. In one of the three most impacted states, Liberia, the rate of infection from EVD has declined. This has been reported for several weeks by the international media and these statistics were acknowledged by Dr. Thomas R. Frieden, the Director of the Centers for Disease Control and Prevention (C.D.C.) in the U.S.
By confirming what healthcare officials and news agencies have reported since early Nov., Dr. Frieden said that previous estimates by the C.D.C. that the Ebola epidemic could lead to 1.4 million cases by January 2015, were no longer valid, citing what he described as “good progress” in Liberia.